Choral singing is enjoying a renaissance, and this timely book contributes to our understanding of what choir work can and should be about. Starting from the idea that education underpins the rehearsal process, James Neilson Graham delves into the theory and practice of working with singers, drawing on the insights of Emile Jaques-Dalcroze in relation to movement and Valborg Werbeck-Svärdström in relation to the voice. Singing is an aspect of our common humanity and the health of the socio-musical organism finds its reflection in the choral sound. How can the individual flourish in the midst of so many? How can the conductor facilitate the process? 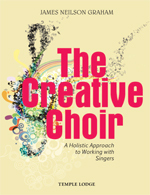 In lively fashion (with more than seventy music examples, diagrams and illustrations), James Neilson Graham challenges orthodoxies and opens up new developmental pathways for the choir leader and the choral singer. The elements of song – words and music – unite in the life and work of James Neilson Graham. Literature came first (degrees, journalism and short stories), before he encountered Valborg Werbeck-Svärdström’s School of Uncovering the Voice and embarked upon singing studies in England and Germany. With the Trinity College Licentiate (music education) under his belt and lengthy spells coaching in Finland and teaching singing in England and Iceland, James has developed a pioneering approach to the art of choral conducting with the emphasis on the needs of singers.